Purpose: 68Ga-labelled compounds are increasingly used for somatostatin-receptor scintigraphy because of their favourable biokinetic properties, a higher tumour-to- background contrast and higher diagnostic accuracy compared to the gamma-emitting tracer 111In-DTPA-octreotide. Recently, we have introduced the new tracer 68Ga-DOTA- 3-iodo-Tyr3-Thr8-octreotide (68Ga-HA-DOTA- TATE). The present study demonstrates the biodistribution and radiation dosimetry of this tracer in humans. Patients, methods: Seven men were enrolled in this analysis. Every patient underwent a 20 min dynamic PET scan after intravenous injection of about 114 ± 9 MBq of 68Ga-HA-DOTATATE. This was followed by two whole-body scans at 30 min p. i. and 120 min p. i. Blood radioactivity concentration was determined non-invasively from a ROI drawn over the aorta. Urine was collected until the time of the last scan. Liver, spleen, kidneys and urinary bladder wall were included in the dosimetric estimation that was carried out with the software package OLINDA 1.0. Results: Physiological 68Ga- HA-DOTATATE uptake was observed in the pituitary gland, thyroid, salivary glands, liver, spleen, kidneys, urinary bladder, adrenals and intestine. Organs with the highest absorbed dose were spleen (0.26 ± 0.11 mSv/MBq), kidneys (0.14 ± 0.03 mSv/MBq) and liver (0.12 ± 0.02 mSv/MBq).The estimated effective dose was 0.024 ± 0.001 mSv/MBq. Conclusion: Our study demonstrates biokinetics and radiation exposure of the 68Ga-labelled tracer HA-DOTATATE to be comparable to other 68Ga-labelled SSR analogues in clinical use. Ziel: 68Ga-markierte Verbindungen werden für die Somatostatinrezeptor-Szintigrafie wegen ihrer günstigen biokinetischen Eigenschaften, dem höheren Tumor-zu-Untergrund-Kontrast und der höheren diagnostischen Sicherheit imVergleich zum gammaemittierenden 111In- DTPA-Octreotid eingesetzt. Vor kurzem wurde der neue Tracer 68Ga-DOTA-3-Iod-Tyr3- Thr8-octreotid (68Ga-HA-DOTATATE) eingeführt. Diese Studie zeigt die Biodistribution sowie die Strahlenexposition dieses Tracers im Menschen. Patienten, Methoden: Sieben Männer wurden in die Studie eingeschlossen. Jeder Patient wurde nach intravenösen Injektion von 114 ± 9 MBq von 68Ga-HA-DOTATA- TE einer dynamischen PET Untersuchung unterzogen (Dauer: 20 min). Danach erfolgten Ganzkörperscans 30 und 120 Minuten p. i. Die Blutradioaktivitätskonzentration wurde nicht-invasiv aus einer über die Aorta gelegten ROI bestimmt. Urin wurde bis zur letzten Untersuchung gesammelt. Leber, Milz, Nieren und Harnblasenwand wurden in die dosime- trischen Berechnungen eingeschlossen, diese erfolgten mit dem Programm OLINDA 1.0. Ergebnisse: Physiologische Anreicherungen von 68Ga-HA-DOTATATE wurden in der Hypophyse, der Schilddrüse, den Speicheldrüsen, der Leber, der Milz, den Nieren, der Harnblase, den Nebennieren und dem Darm beobachtet. Die Organe mit der höchsten absorbierten Dosis waren die Milz (0,26 ± 0,11 mSv/MBq), die Nieren (0,14 ± 0,03 mSv/MBq) und die Leber (0,12 ± 0,02 mSv/MBq). Die effektive Dosis betrug 0,024 ± 0,001 mSv/MBq. Schlussfolgerung: Unsere Studie zeigt, dass die Biodistribution und Strahlenexposition des 68Ga- markierten Tracers HA-DOTATATE mit anderen 68Ga-markierten SSR-Tracern im klinischen Gebrauch vergleichbar ist. 1 Banerjee SR, Pomper MG. Clinical applications of Gallium-68. Appl Radiat Isot 2013; 76: 2-13. 2 Brogsitter C, Schottelius M, Zophel K. et al. 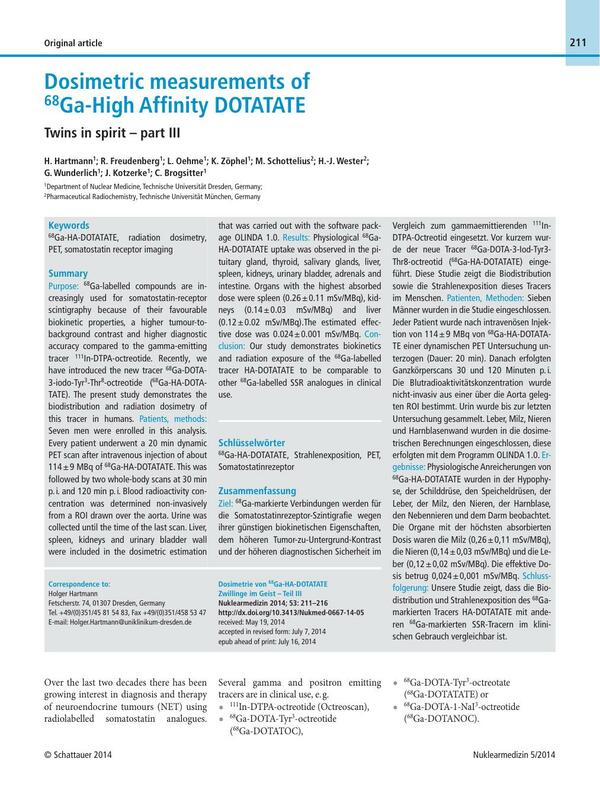 Twins in spirit: DOTATATE and high-affinity DOTATATE. Eur J Nucl Med Mol Imaging 2013; 40: 1789. 3 Brogsitter C, Zophel K, Hartmann H. et al. Twins in spirit part II: DOTATATE and high-affinity DOTATATE-the clinical experience. Eur J Nucl Med Mol Imaging 2014; 41: 1158-1165. 4 Eberlein U, Lassmann M. Dosimetry of [68Ga]-labeled compounds. Appl Radiat Isot 2013; 76: 70-74. 5 Forrer F, Uusijarvi H, Waldherr C. et al. A comparison of 111In-DOTATOC and 111In-DOTATATE: biodistribution and dosimetry in the same patients with metastatic neuroendocrine tumours. Eur J Nucl Med Mol Imaging 2004; 31: 1257-1262. 6 Hartmann H, Zöphel K, Freudenberg R. et al. Radiation exposure of patients during 68Ga-DOTA-TOC PET/CT examinations. Nuklearmedizin 2009; 48: 201-207. 7 Hietschold V, Koch A, Laniado M. et al. Computed tomography: influence of varying tube current on patient dose and correctness of effective dose calculations. Röfo 2008; 180: 430-439. 8 Hofheinz F, Pötzsch C, Oehme L. et al. Automatic volume delineation in oncological PET. Evaluation of a dedicated software tool and comparison with manual delineation in clinical data sets. Nuklearmedizin 2012; 51: 9-16. 9 Kroiss A, Putzer D, Decristoforo C. et al. 68Ga-DOTA-TOC uptake in neuroendocrine tumour and healthy tissue: differentiation of physiological uptake and pathological processes in PET/CT. Eur J Nucl Med Mol Imaging 2013; 40: 514-523. 10 Pettinato C, Sarnelli A, Di Donna M. et al. 68Ga-DOTANOC: biodistribution and dosimetry in patients affected by neuroendocrine tumors. Eur J Nucl Med Mol Imaging 2008; 35: 72-79. 11 Putzer D, Kroiss A, Waitz D. et al. Somatostatin receptor PET in neuroendocrine tumours: 68Ga-DOTAO,Tyr3-octreotide versus 68Ga-DOTAO-lan-reotide. Eur J Nucl Med Mol Imaging 2013; 40: 364-372. 12 Sandstrom M, Velikyan I, Garske-Roman U. et al. Comparative biodistribution and radiation dosimetry of 68Ga-DOTATOC and 68Ga-DOTATATE in patients with neuroendocrine tumors. J Nucl Med 2013; 54: 1755-1759. 13 Stabin MG, Sparks RB, Crowe E. OLINDA/EXM: the second-generation personal computer software for internal dose assessment in nuclear medicine. J Nucl Med 2005; 46: 1023-1027. 14 Virgolini I, Ambrosini V, Bomanji JB. et al. Procedure guidelines for PET/CT tumour imaging with 68Ga-DOTA-conjugated peptides: 68Ga-DOTA-TOC, 68Ga-DOTA-NOC, 68Ga-DOTA-TATE. Eur J Nucl Med Mol Imaging 2010; 37: 2004-2010. 15 Walker RC, Smith GT, Liu E. et al. Measured human dosimetry of 68Ga-DOTATATE. J Nucl Med 2013; 54: 855-860. 16 Williams LE, Liu A, Yamauchi DM. et al. The two types of correction of absorbed dose estimates for internal emitters. Cancer 2002; 94: 1231-1234. 17 Krenning EP, Bakker WH, Kooij PP. et al. Somato-statin receptor scintigraphy with indium-111-DTPA-D-Phe-1-octreotide in man: metabolism, dosimetry and comparison with iodine-123-Tyr-3-octreotide. J Nucl Med 1992; 33: 652-658.